The primary aim in treating shoulder conditions through conservative management is to reduce pain and improve function, and exercise rehabilitation is usually the cornerstone of this conservative management plan. 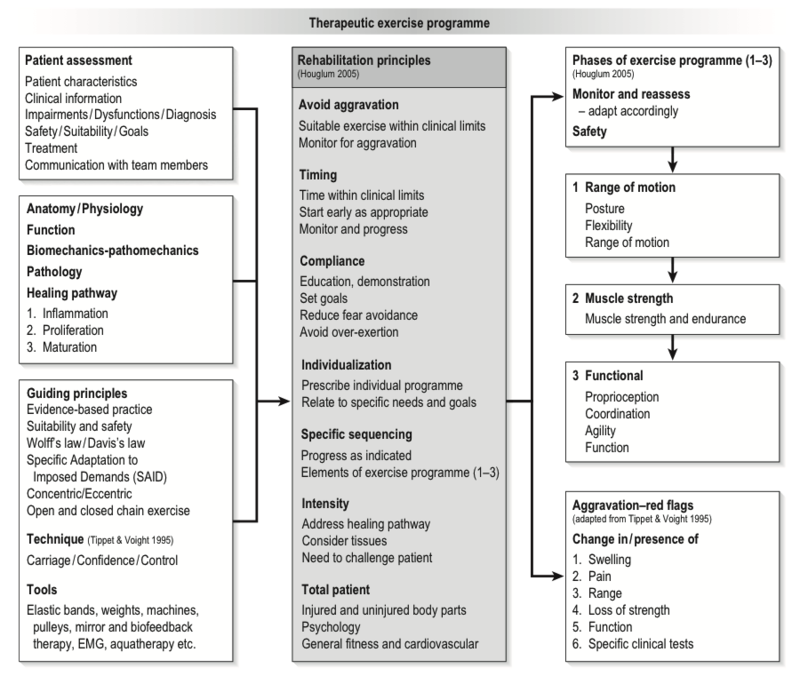 The goal of exercise as part of the physiotherapy management is to correct modifiable physical impairments thought to contribute to pain and dysfunction, rather than to treat the pathology. Therapeutic exercise is commonly used in the treatment and management of a range of shoulder disorders, is commonly advocated to address dysfunctions in mobility, posture, muscle activation, proprioception and strength and is supported by much research. More recently, there has been increasing interest in exercise rehabilitation as a means to manage partial and full thickness tears of the rotator cuff by specifically addressing weakness and functional deficits. Recent studies have suggested that patients opting for physiotherapy have demonstrated high satisfaction, an improvement in function, and success in avoiding surgery . Consensus on dosage, frequency, method of delivery, acceptable pain tolerance, inter-exercise activity levels, and specific exercise inclusion has not been achieved.. Optimal parameters of exercise and load have yet to be determined as has the mechanism by which therapeutic response occurs . Recent EMG studies have indicated that rotator cuff muscles are recruited in a reciprocal, direction-specific pattern during shoulder flexion and extension exercises. Wattanaprakornkul et al  demonstrated that during flexion, the posterior externally rotating cuff muscles (supraspinatus and infraspinatus) were activated at significantly higher levels than the anterior internally rotating cuff muscle (subscapularis), while during extension the reverse occurs. This muscle contraction in a reciprocal direction-specific manner supports the role of the rotator cuff as shoulder joint dynamic stabilizers to counterbalance antero-posterior translation forces and that the rotator cuff provides shoulder joint support by preventing flexion and extension prime movers of the humerus e.g. the deltoid, from translating the humeral head on the glenoid fossa. This EMG knowledge gives us more information to specifically target the rotator cuff muscles in different positions and ranges of movement. Retraining and strengthening of the anterior deltoid has also been a focus for massive cuff tear patients. The Torbay Protocol, developed and trialled by Roberta Ainsworth initially as a pilot study and then in an RCT for a rehabilitation programme for patients with a diagnosis of massive, irreparable rotator cuff tears of the shoulder  and provides guidelines for the physiotherapy rehabilitation of these patients based on a progressive strengthening program aimed at the anterior deltoid and teres minor muscles. The program was based on the observation that patients with massive rotator cuff tears utilized the anterior portion of deltoid in order to achieve elevation without upward shearing of the humeral head. The deltoid, which is a pennate muscle composed of three portions, covers the entire shoulder joint and are recruited to move the humerus in relation to the scapula. The anterior portion is a prime motor during shoulder flexion and horizontal adduction of the shoulder, while the lateral/middle portion acts during abduction and horizontal abduction and the posterior portion is recruited during horizontal abduction. An important function of deltoid is the prevention of subluxation or even dislocation of the head of the humerus, particularly when carrying a load, improving joint stability by resisting lower pulling forces applied to the upper limb.Analysis of the deltoid muscle indicates that the anterior deltoid has the greatest potential to cause joint destabilization. The deltoid muscle is an anterior stabilizer of the glenohumeral joint with the arm in abduction and external rotation and as such the stabilizing function of the deltoid muscle takes on more importance as the shoulder becomes unstable . Traditionally many strength training exercises place emphasis on the anterior deltoid, which could encourage the development of muscular imbalance between individual portions of the deltoid and increase joint instability. Therefore, strength training that incorporates middle and posterior deltoid muscle could enhance its role in improving shoulder stabilization. Both group and individual physiotherapy interventions which incorporate exercise aim to reduce pain and disability, but a consensus is a lack of evidence for the most effective mode of treatment delivery for people for exercise rehabilitation in musculoskeletal pain. Although it is clear that group and individual physiotherapy interventions that incorporate exercise are better than minimal or no treatment, it remains unclear whether either is better than the other. O'Keeffe et al, in a broad study of exercise for musculoskeletal pain, found only small, clinically irrelevant differences in pain or disability outcomes between group and individual physiotherapy, and concluded that group interventions may need to be considered more often given their similar effectiveness and potentially lower healthcare costs. Specifically to the shoulder, recent evidence suggests that group exercise classes can improve shoulder pain and disability in people with non-specific shoulder pain . There is a lot of disagreement in relation to pain with exercises. Should exercises be painful during rehabilitation? If yes, then how much pain is ok? If no, then will our patients who are very irritable be limited in their ability to participate in any exercise program and what impact will that have on their management? Smith et al suggest that, in the short term, protocols using painful exercises for musculoskeletal conditions offer a small but significant benefit over pain-free exercises, however in the medium and long term the evidence is lacking. Pain during therapeutic exercise for chronic musculoskeletal pain need not be a barrier to successful outcomes. What role does fatigue play in shoulder pain? What are the implications for us as physiotherapists when prescribing exercises to individuals? Recent research suggests that the supraspinatus tendon significantly increased in thickness in response to acute fatigue loading in individuals with shoulder pain when compared with pain-free controls. Reduced subacromial space was also noted when loading the rotator cuff to fatigue, with recovery to baseline delayed for up to 24 hours in individuals shoulder pain as a result of rotator cuff tendinopathy. Rehabilitation programmes for rotator cuff tendinopathy need to take into account the potential for increased tendon thickness and reduced subacromial space after loading, as such exercise type and dosage should be titrated to avoid excessive loading to fatigue, and appropriate recovery periods after loading to fatigue should be implemented . ↑ 1.0 1.1 1.2 Littlewood C, Ashton J, Chance-Larsen K, May S, Sturrock B. Exercise for rotator cuff tendinopathy: a systematic review. Physiotherapy. 2012 Jun 1;98(2):101-9. ↑ 2.0 2.1 2.2 2.3 2.4 2.5 Edwards P, Ebert J, Joss B, Bhabra G, Ackland T, Wang A. Exercise rehabilitation in the non-operative management of rotator cuff tears: a review of the literature. International journal of sports physical therapy. 2016 Apr;11(2):279. ↑ 3.0 3.1 Ainsworth R, Lewis J, Conboy V. A prospective randomized placebo controlled clinical trial of a rehabilitation programme for patients with a diagnosis of massive rotator cuff tears of the shoulder. Shoulder & Elbow. 2009 Jul 1;1(1):55-60. ↑ McEvoy J, O’Sullivan K, Bron C. Therapeutic exercises for the shoulder region. Manual Therapy for Musculoskeletal Pain Syndromes: An Evidence-and Clinical-Informed Approach. 2015 Apr 28;373. ↑ Cleland J: A lecture on the shoulder girdle and its movements. Lancet 1881;1:11-12. ↑ Smith J et al., Effect of scapular protraction and retraction on isometric shoulder elevation strength. Arch Phys Med Rehabil 2002;83:367–70. Level of evidence: 3B. ↑ Wattanaprakornkul D, Halaki M, Cathers I, Ginn KA. Direction-specific recruitment of rotator cuff muscles during bench press and row. Journal of Electromyography and Kinesiology. 2011 Dec 1;21(6):1041-9. ↑ Wattanaprakornkul D, Halaki M, Boettcher C, Cathers I, Ginn KA. A comprehensive analysis of muscle recruitment patterns during shoulder flexion: An electromyographic study. Clinical Anatomy 2011;24:619–26. ↑ Kido T, Itoi E, Lee SB, Neale PG, An KN. Dynamic stabilizing function of the deltoid muscle in shoulders with anterior instability. The American journal of sports medicine. 2003 Mar;31(3):399-403. ↑ Franke AR, Botton CE, Rodrigues R, Pinto RS, Lima CS. Analysis of anterior, middle and posterior deltoid activation during single and multijoint exercises. The Journal of sports medicine and physical fitness. 2015;55(7-8):714-21. ↑ 17.0 17.1 O'Keeffe M, Hayes A, Mccreesh K, Purtill H, O'sullivan K. Are Group-Based And Individual Physiotherapy Exercise Programmes Equally Effective For Musculoskeletal Conditions? A Systematic Review And Meta-Analysis. Br J Sports Med. 2016 Jun 24:Bjsports-2015. ↑ Barrett E, Conroy C, Corcoran M, O'Sullivan K, Purtill H, Lewis J, McCreesh K. An Evaluation Of Two Types Of Exercise Classes, Containing Shoulder Exercises Or A Combination Of Shoulder And Thoracic Exercises, For The Treatment Of Nonspecific Shoulder Pain: A Case Series. Journal Of Hand Therapy. 2017 Dec 4. ↑ Smith BE, Hendrick P, Smith TO, Bateman M, Moffatt F, Rathleff MS, Selfe J, Logan P. Should exercises be painful in the management of chronic musculoskeletal pain? A systematic review and meta-analysis. Br J Sports Med. 2017 Jul 12:bjsports-2016. ↑ Increased supraspinatus tendon thickness following fatigue loading in rotator cuff tendinopathy: potential implications for exercise therapy. Available from: https://www.researchgate.net/publication/322099282_Increased_supraspinatus_tendon_thickness_following_fatigue_loading_in_rotator_cuff_tendinopathy_potential_implications_for_exercise_therapy [accessed Feb 05 2018].